This weekend we mark the 10th anniversary of the attack on the World Trade Center and the Pentagon - as dastardly a deed as has been perpetrated on our country in its history. And, even as remembrances are being prepared throughout the country, we hear of the possibility of another attack planned for this weekend by the same band of lunatics, as THEY also mark this anniversary. 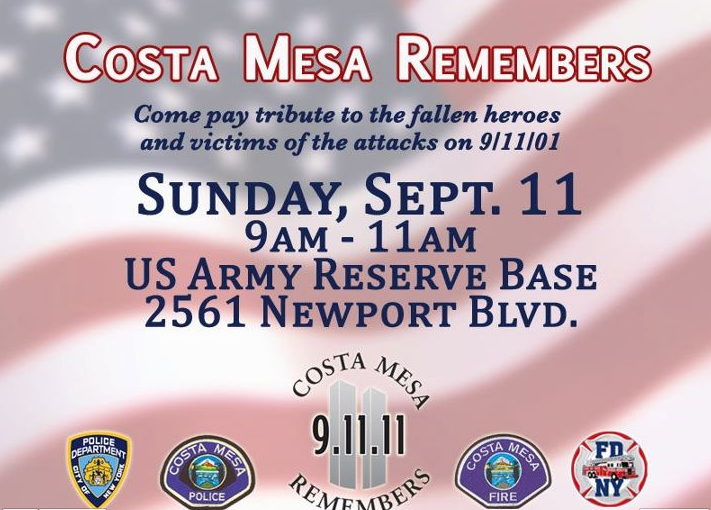 In Costa Mesa a remembrance will be held on Sunday, Patriot Day, beginning at 9 a.m. Here's a copy of the flier for the event . Those of you who have been loyal readers since I began this blog in 2005 will recall that I've written about this tragic day every year. Today I'm not going to try to recount all those essays, but will provide you with links to them so you can visit or re-visit my thoughts as each year passed. I will also refer you to the CNN 911 Memorial link I've had on the side of this page since the beginning. You can also reach it HERE. It provides you with information about the victims in many different ways - by name, by company, by flight, etc. 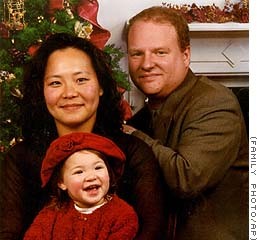 It tells you, for example, that the youngest person killed that day in those events was then-2 year-old Christine Hanson, shown here with her parents, who also perished. 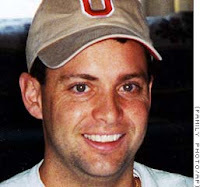 In the past I've written about Todd Beamer, whose battle cry of "Let's Roll!" launched a counter-attack on Flight 93 that probably saved hundreds of lives in Washington, D.C. as the embattled hijackers flew that plane into the ground near Shanksville, Pennsylvania. That day had many heroes - those brave first responders who did their very bes t to save the occupants of the Twin Towers as they burned and, eventually, imploded. Hundreds sacrificed their lives to save others. This weekend we will hear those stories, and many more, all over again as our nation pauses to mark this day. Here are the links to my previous essays about September 11, 2001. In them I wrote about friends who were personally impacted by the crashes, and about not knowing if some of them survived. I wrote about the victims and survivors and much, much more. The first two were published on my earlier host site which provided no way to show images. I also wrote about the day we finally managed to locate and kill Osama Bin Laden earlier this year, HERE. As we mark this day, I think it's important to try to put this "War on Terror" into perspective. HERE's a link to a site that will give you information about casualties in all other wars and police actions in which the United States of America has been involved. I DO NOT, for one second, diminish the loss of American lives over this past decade - every single one is precious. The advancements in battlefield medical treatment and the speed with which our troops can be retrieved from the battlefield and delivered to medical care is tremendous, which has kept the death count lower than decades ago in the Viet Nam War, for example - where more than 58,000 Americans died over the four years of that strife. Please take a few minutes to visit this site. I hope you'll find a few minutes Sunday to stop and consider what the events of September 11, 2001 has meant to this country. The loss of life and treasure is almost too difficult to calculate and the battle is far from over. Please pause to give thanks to the men and women of our armed forces who VOLUNTEER to fight this battle and do so with pride and bravery. Remember young Costa Mesa immigrant, Jose Angel Garibay, who joined the Marines, hoped one day to become a Costa Mesa police officer and was among the very first American troopers to die in the War On Terror. And don't forget our brave first responders - those Firefighters and Police Officers who stand tall, protecting us every day. Click HERE for a very special remembrance of Garibay's service by a Costa Mesa employee. Finally, this powerful video clip - one of dozens available for viewing on YouTube - with background music by Alan Jackson, will remind you of the horror of that day. As you watch it remember the lives that were snuffed out after those airplanes crashed into the buildings in New York City and Washington, D.C. Remember those brave souls who fought back on Flight 93 and died in that field in Pennsylvania. Remember that, as the Twin Towers crumbled, nearly three thousand people died. They didn't pass quietly in their sleep, they were murdered. Those who did not die immediately when the planes hit the buildings or didn't leap to their deaths to escape the flames were crushed, torn limb from limb and vaporized - many were never identified. A neighbor, moved by this blog entry, sent me THIS LINK to a CNN report from 2002. It's 90 minutes of coverage of that day, presented while the wounds were still open and festering. World Trade Center human remains recovered. Remains never matched to a victim. Victims never identified through remains. Average government settlement for families of those killed. Minimum number of people found to have 9/11-related asthma and other lower respiratory ailments. Minimum found to have 9/11-related PTSD and other mental illness. Estimated number of children who lost a parent on 9/11. Are Riggy and Mensinger going to cancel any tribute that brings good thoughts to Police and Firefighters? Riggy, Steve, and Gary? Beve? How about canceling Veterans Day? Might be your style? Tears still come to my eyes when Im reminded of 911. I remember waking up to the tv showing the twin towers on fire. As the minutes passed quickly realized what happened. Terrorists had attacked our country and for no apparent reason. We were happily living our lives and all of a sudden, a blow from nowhere. I felt hatred and still do hate terrorists to the point where I dont care mention on here. These days, I live my life as a city employee. I would compare our recent tragic events to the morning of 911. We were all living our lives and all of a sudden Righeimer comes in and issues 213 pink slips. I remember the afternoon of march 17. I was driving back to city hall when I saw the police cars, then yellow tape and my coworkers crying. When I found out that a coworker jumped, that same feeling of shock of 911 came back. We were all happily living our lives and out of nowhere, unnecessary pink slips. All of a sudden our world was turned upside down. I hate the council. I cant believe what they are doing to us just to further their own political careers. Thank you Geoff for your blog. Gericault, your need to lie just never ceases to amaze me. You just sit around all day, every day, making up stuff. Less than 3,000 people died in the 911 tragedy. Don't make it any worse than it was. Watching Dateline last night on 9/11 with teary eyes, and I just continue to be amazed how Al Qaeda could pull that off, and the heroism of those first responders on the ground and the passengers on Flight 93, and so many other thoughts rush to your head. Made me realize how much good there still is out there... and I needed that after watching 'The Tillman Story' the night before and seeing the lies the top generals in the land and Rumsfeld told, under oath before Congress and the Tillman family, to cover up their deception. With great power comes great responsibility, and and those smug bastards took no responsibility for their lack of action and passed the buck, and it really pisses me off! If you haven't seen it, I urge you to watch it. Government is capable of many great things... while at the same time, it's very hard to believe what they tell you! It's hard to imagine a more callous, stupid comment being posted here. Gericault provided the link to the New York Times piece on this tragedy. A sub-set of that piece is entitled "Loss by the numbers" and can be found here: http://www.nytimes.com/2011/09/08/us/sept-11-reckoning/index-loss.html, which provides the numbers Gericault gave us plus much more. Please don't use this site to puke up your political bias, you disrespectful jerk. Take your crap elsewhere! Please go back and read Jeanette Chervony's moving piece about her personal experience at Jose Garibay's service. I added it after the fact. Pot Stirrer, More Lies did not know your rules. He or she was not aware that you can come here and say anything you want about the City Council and individual members, but you cannot say anything about Greg Ridge or the Pot Stirrer himself. The need for journalists to sensationalize a tragedy such as 911 is sick. The untimely deaths of 2,780 human beings should not be so crudely announced as "21,817 human remains"; not in the NY Times, or on this blogsite. My younger brother died on 911 and I think he and the others deserve some dignity. Geoff, More Lies reminds me of those who say the holocaust didn't happen and the moon landing was a conspiracy. It is hard for me to believe that people like him are even Americans. All Gericault did was copy a link by the NY Times. He did not make up the fact and figures presented. I guess to More Lies the NY Times is lying too. Really? Have you visited this site long? If so, you know that we accept the slings and arrows. Gericault, as Daisy Mae said, simply provided statistics that quantify the horror of that event directly from the New York Times article. Jerry, I'm very sorry for your loss but, in my opinion, people need to understand the scope of this tragedy. It wasn't just buildings toppling - thousands of people died horrible deaths at the hands of extremists who have vowed to destroy us ALL. Nowhere does he say 3000 deaths... re-read that, 'Lies'... he said that's how many children lost a parent. Your comprehension leaves a lot to be desired. More lies......if you click the links even further to see the actiual source it's from the New York City Chief Medical Examiners Office. ....To argue with a man who has renounced his reason is like giving medicine to the dead. Thanks for everyone else jumping in.......but I already know what we are dealing with here. It's really not necessary. It's really impossible to respond to something like this and be able to accommodate everyone's feelings on what is appropriate or not. @Jerry, My deepest sympathies to you. @Danny boy, my son and I were just talking about how "angry" our country has become in the past 3 years. Nasty comments, hateful bumper stickers, public rudeness and the return of rampant class-ism. I told him about how right after 9/11, people were just nicer to each other in an ordinary day to day way. We are felt bonded by the shock and hurt, and the solidarity as Americans. I wish that had carried on as the norm. Your comment reminded me to "be the change the I want to see." Thanks Danny. I read an earnest, poignant tribute to the thousands of lives immediately affected during the 88 minutes it took to forever change not only America, but the entire world; how this event has and will forever change the “Norm” which was so quickly taken away from all of us. To then turn the page, anticipating more heartfelt retrospect, deep insight and solace one gets from being around close friends and family after burying a loved one… what did I find? Here, nesting among the protection of anonymity; bitter, self-serving, aggrandizing, ignorance. …roll the dice and get a clue; get over yourself. You’re in NO WAY helping your case. Whatever compassion I felt for you and your dedicated, hardworking, loyal compatriots and their families during this time of uncertainty, like Elvis… it “HAS LEFT THE BUILDING”. You are absolutely right. The comparison of the pink slips to city employees to a national tragedy is blatantly stupid and frankly BS. I am an employee of the city, and to read that alleged employee's comments is frankly embarassing. I'm not happy with the state of the city, nor the politics du jour, but what is happening here is NOT a national tragedy. While the happenings of the city could have national implications, it can not and should not ever be compared to the events of 9/11. Whoever you are that wrote that, you should be ashamed of yourself. Just like 911 effected some people more than others so too did the death of an employee at city hall. For many family members and friends that single death did effect them more than 911. It is unfair of you, Longhair, to go go off on your rant when you simply are incapable of understanding. Then, for you to make a broad generalization and proclaim your new loss of compassion for people who are suffering is not only also out of place on this thread but it shows a callousness that I though was previously reserved for the CM city council. Way to prove me wrong. Unfortunately your post only reflects poorly on yourself. I totally agree with the demonized city employee. I too am an employee and we are referred to as prisoners by the councilmen. Its apparent to me that they want to wash the blood off of their hands and want to forget what theyve done. We employees will never forget. The councilmen may be able to order division heads to rid of memorial flowers for huy but you will never be able to take away our memories. Lost of Respect... back at ya. My "RANT" proves me more than capable of understanding; you just chose to read it using your myopic eyes while refusing to use corrective lenses. Geoff’s post was a tribute, a memorial; to those ‘Specifically’ connect to that “ONE” event… NO MORE, NO LESS! Fact: I lost my primary income in 2008 to down-sizing. Fact: As of this week, my 401K (one that I have diligently funded for 20 years) is worth 50% less than 3 years ago. Fact: A small business I have had for 17 years can no longer afford ANY employees; due to a 60% loss in clientele. Fact: I am MORE than capable of understanding! I dont feel sorry for you. Join the club! Fact: costa mesa doesnt have financial problems. If they are so broke, how do they afford $1,000 an hour on legal services? Fact: When times were good, no one cared about the measly city employee salaries. And stop adding it all up. We all know health care is a rip off and they dont pocket the very right column. They make decent money, not the hundreds of thousands that you did until the economy bit you. Fact: The nation's problems are of no fault of the employees or unions. Remember that liar liar loan you got? Yeah that one! Where you lied about your income to get into a house you couldnt afford? The one you got by using your house as an atm! Yeah! THATS what caused this! Go cry somewhere else. Youre not going to get sympathy here!